This is the weekend to celebrate the laborers and since I fall into that category, I took the day off. The day started off pretty slowly - got up late, drank some coffee, and decided to go to Texas for the day. Since my life partner and I didn't have any plans while we were there, we decided it was a good day for an adventure. Mostly our adventures involve driving to no particular destination and getting lost. In our case, lost isn't a bad thing - it just means we'll have to consult a map (or ask directions - women can get away with that sort of thing) to discover the best way back home. We drove around Dallas. We drove around Denton. We also drove around some other towns we didn't bother to catch the names of. While we were in Dallas, we went to Cafe Brazil for some lunch and the BEST cup of coffee in town. Afterwards we drove around some more and located Boba Latte in Richardson. They have the widest selection of drinks. They used the freshest ingredients (barely any powders in sight). Their drinks were wonderful! This is definitely a place to go when you have a thirst for a bubble tea. There are scads of accessories and phone charms for mobile phones. I haven't been much into it except for a case or two (and that is just to protect my precious). I may, however, make an exception for these. 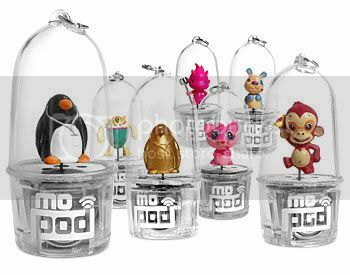 When I saw these mopods for my phone I really did think "I must have all of those". 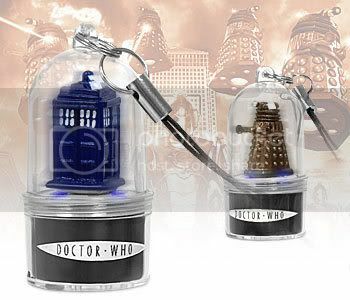 ...and all thoughts of the mopods were quickly exterminated. exactly how much alcohol was consumed prior to thinking this was a good idea? was anyone aware of exactly how toxic burning plastic can be? how many IQ points were lost in the making of those films? did any of these attempts result in the fire alarm sounding? All that aside, my favorite had to be the microwaved Christmas lights. *Disclaimer: 102 uses were not found at the aforementioned website. However, I'm sure you could find that many if you searched the Internet. And as always - do not try this at home. I spent part of my evening last night at a local hangout. 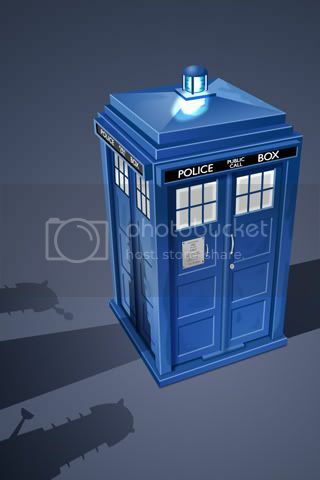 Someone managed to notice my iPhone wallpaper which is currently the "TARDIS in Trouble" from the Icon Factory. him: "cool - the TARDIS"
me: "yeah - you a fan?" him: "oh yeah - Who is your favorite Doctor?" him: ...confused look...silence "oh, the third doctor"
him: "don't you wish more people knew about Doctor Who"
me: "no, not really - I like knowing that I am a minority. I enjoy being someone who can choose what I like without the help of the voice of the masses. Don't you?" him: "it would just be nice if more people knew about it"
me: "well it was nice chatting with you"
You know - he never asked me about anyone other than the doctor. If he had, we would have had a pretty good conversation. I have been a pretty big fan of the show since way back when it was shown on the local PBS. When I first started watching it, they were already on the fourth Doctor. It was K-9 that was my first reason to watch it and Nyssa that made me stay. The sidekicks (companions) were always the main draw for me to watch the show. What do you do when your child has tested your limits? Test theirs and laugh. This is something along the lines of what I could see my sister doing to one of her five children if they ever crossed her. There's nothing quite as frightening as the realization that your kids will probably act the exact same way you did when you were their age. Which pretty well sums up why I never want to have children. If my mother had of ever thought of anything as remotely creative as this, I would have been even more seriously warped than I already am. Frank over at PostSecret has created a mini movie that includes some of the secrets that have been sent to him over the years. The movie is beautiful and the music ('Breathe Me' by Sia ) is hauntingly appropriate. I've been a longtime visitor to the site. The secrets are sometimes familiar and other times disturbing, but they are always wonderful to read. I believe that it helps people to be able to display their secrets to be free of them. I haven't ever sent one in, but it is a good feeling to know I would have a place to send them if I ever needed to. Keep up the good work Frank - your labor of love helps heal those who need it. That motorcycle got me several girlfriends. It was the best weapon I had for winning over the chicks. Ultimately, he decides that he is a "biker computer geek." Update: Maybe I need a good geek tattoo to go with my new image. This picture is of the end result of something very, very wrong. What looks like a very nice tattoo, turns into something completely sick when you see how it was done. The girl in this photo had the design carved into her skin. Who would have ever guessed that having your skin carved would be something to willingly have done. Oh my gosh - what was this woman thinking? You couldn't pay me to do this - let alone pay someone else to do it to me. Someone sent me these very disturbing photos at work in my email. I couldn't believe that anyone would do this to themselves for any reason. Click here to lose your lunch (may not be safe for work - or anywhere else for that matter)! Apparently this has already made the Internet rounds, but I was just sent this today (right before lunch.... ugh!). I found out today from the Oracle that I am clueless. I believe whole heartedly that it is true because it came from an Oracle. You must always take anything to heart that comes from something of a higher power. You don't go to Starbucks much; when you do you just tag along with other people since you have nothing better to do. You would like to order a Tazo Chai Crème but don't know how to pronounce it. Most people who drink Iced Caramel Macchiato are strippers. I love the creativity behind this (the art is a little lacking), but the concept is great. I think this falls under the same concept qualifications as One Red Paperclip and The Million Dollar Homepage. Went to see the Bourne Ultimatum this afternoon. This is the third Bourne movie. The first was The Bourne Identity and the second was the The Bourne Supremacy. The story line was as great as the previous movies. The acting was the same quality as the two other movies. The characters were mostly believable (it is hard to get characterization going right in an action flick). The biggest drawback to the whole movie was the camera work. I think I could have done better. The camera was all over the place - it was like they shot the whole thing from a moving automobile without any shocks/struts/properly inflated tires. The man behind me commented that he was starting to get "dizzy" while watching it. As if the dizzying camera work weren't enough, they added cheesy B-movie sound effects to the mix. I swear I heard some of the same sounds from this movie in The Andromeda Strain (which I watched a couple of weeks ago - one of my favorites). After watching this movie I want to meet the director and ask what the hell were you thinking? I did love seeing the product placement for Vespa. The scooter "chase" was the best part. Last year I went to the OKC Tattoo Convention (I missed it this year) and was able to see (unfortunately not meet) Kat Von D. Kat has been stealing the show on Miami Ink for quite some time, but this year Kat has opened her own shop - and has her own show, LA Ink. The show starts August 7th and I can't wait. I just loooove looking at those star spots of hers. In the meantime, I can make do with the oh so very nice pin-up calendar that TLC has been so kind to post for download. Kat encompasses all the qualities I love in a woman: strong, smart, out spoken, and oh so beautiful. I wish her all the best with her new shop and new show.